Well this is it. The most amazing caprese salad I’ve had and it’s a grilled peach avocado caprese salad with a balsamic reduction and grilled lemons. It’s so easy though! Caprese salad (Italian: Insalata Caprese [insaˈlaːta kaˈpreːze] ‘Capri salad‘) is a simple Italian salad, made of sliced fresh mozzarella, tomatoes, and sweet basil, seasoned with salt and olive oil; it is usually arranged on a plate in restaurant practice. 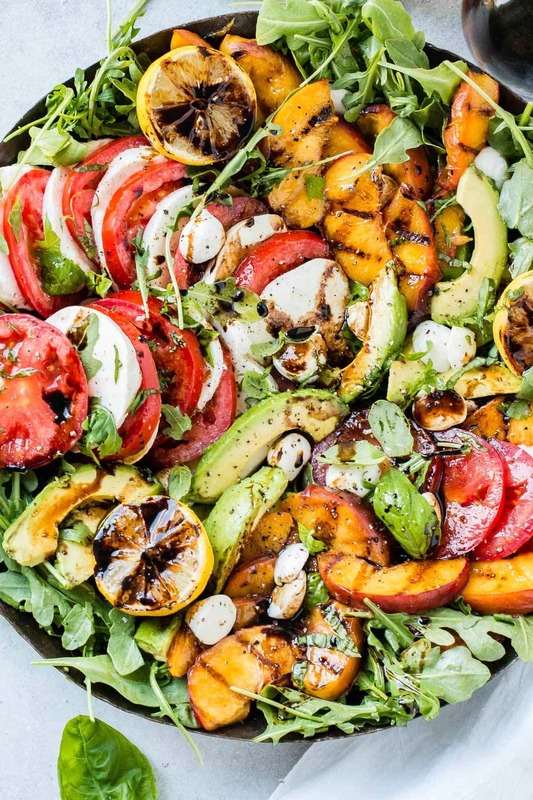 What is more awesome than a grilled peach avocado caprese salad? One with a balsamic reduction and grilled lemons, of course!! 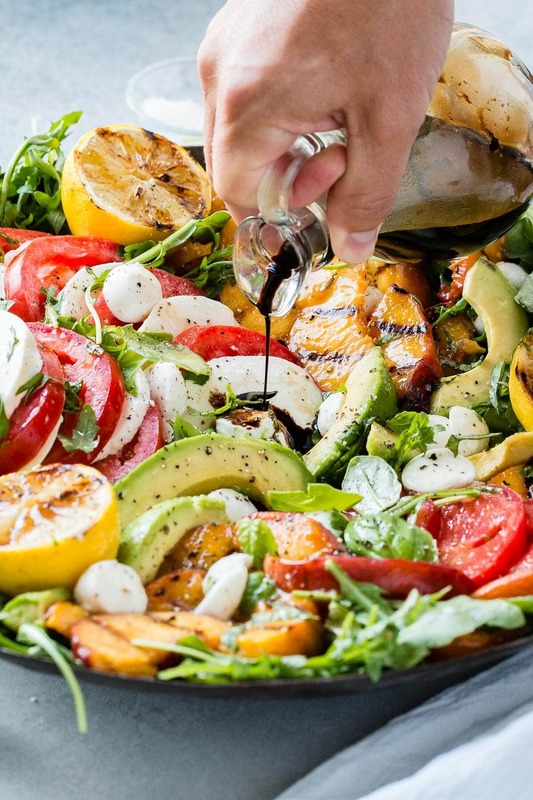 That balsamic reduction could totally be skipped and you could just use balsamic vinegar which truly is delicious on its own, but reducing it down brings out a lovely consistency and sweetness that is hard to skip once you’ve had it. 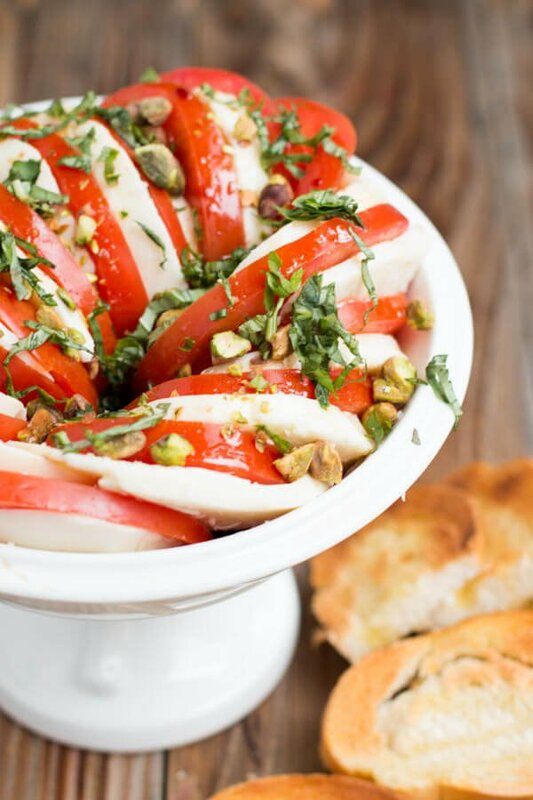 How Long Will Caprese Salad Keep? 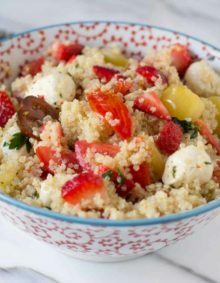 I recommend eating within 24 hours but this Caprese Salad will stay good in the fridge for 2-3 days. It can get a bit juicy, so drain before serving. It’s always better the fresher you can serve it, but we do love this as leftovers. Balsamic reduction only needs one ingredient, balsamic vinegar, the better quality the better tasting, and medium high heat which you’ll turn to a simmer once it begins to bubble away. We occasionally add a teaspoon of sugar to give it a slight sweetness. It just simmers until reduced by half, which could be as quick as 10 minutes or as long as 20 depending on how much liquid you added to the pot. 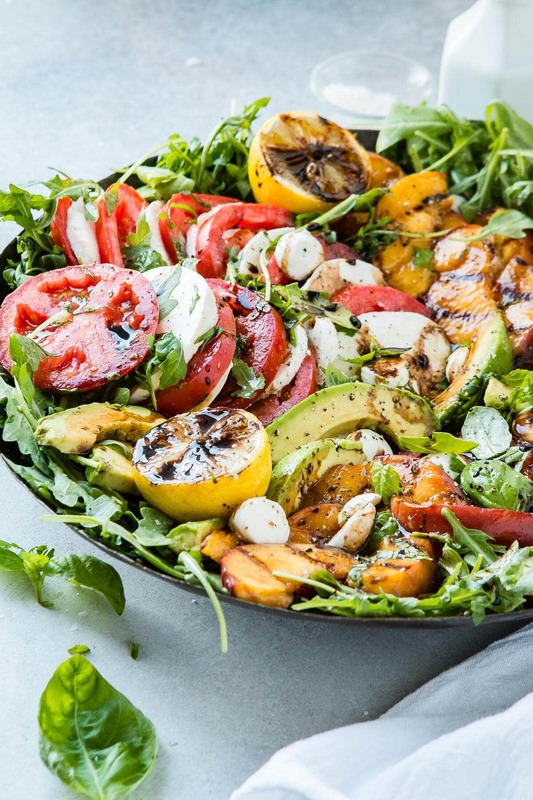 Speaking of pots, we prefer to reduce balsamic vinegar in a low rimmed skillet as the more surface heat you get the quicker it reduces. Our favorite non-stick pan, T-Fal Non-stick works great and it’s under $30 for a big pan (the smaller sizes work when I’m doing a smaller batch). If you don’t have a good non stick, take 5 seconds to get that one. Now the grilled lemons, don’t skip that. And don’t just serve them sliced. Grilling totally changes this little fruit into something spectacular. The lemons become sweet instead of sour and have this depth of flavor that is just not comparable with the fresh fruit. It really is one of my favorite things like on this Greek Chicken Souvlaki. Slice your lemon in half, brush the flesh with a little olive oil. Place the lemons flesh side down, and grill on medium high heat until grill marks appear, about 2-3 minutes. We just use a simple pastry brush, we have this set of two Pastry Brushes for $8.99. I guess you could buy silicone but sometimes it doesn’t hold sauces as well, or you could get more expensive ones, but I love a good deal and this is our favorite brush set right now. Now, on to the grilled peaches. Let’s learn how to grill a peach, because that’s one of my favorite parts about the end of summer. It’s the healthier version of our Deep Fried Peaches and Ice Cream. Peaches are just like the lemons. 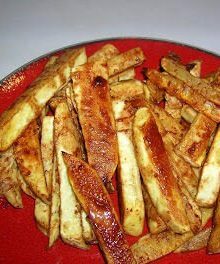 You can slice in half and brush with a little oil to help them not stick, but while this takes a little longer, I prefer to slice the fruit into wedges and grill on each side. It cooks the peach a little which provides a contrast in texture to the salad and its presentation is lovely. Wondering how long to grill peaches? Just like the lemons it will only take about 2 minutes. Easy-peazy-lemon-squeezy. The most important part about how to make a caprese salad is not in the recipe or preparation, it’s in the ingredients. Because this is a salad where the individual ingredients are pretty much eaten as is you’ll want to select the best. Look for local tomatoes that are heavy in weight, rich in color and feel tight like a water balloon when you press on the skin. The tomatoes should not feel empty and hard, that means they were picked too early. Buy fresh mozzarella that will have better flavor and texture. Fresh mozzarella is softer and you’ll notice liquid around it. Burrata is a great choice as well, but we buy fresh, water packed mozzarella so it will hold its shape when sliced. A little fresh ground black pepper and Real sea salt (which is the only salt we buy) or Maldon Flaked Sea Salt along with high quality extra virgin olive oil and balsamic vinegar are all you’ll need for seasoning so look for the best. 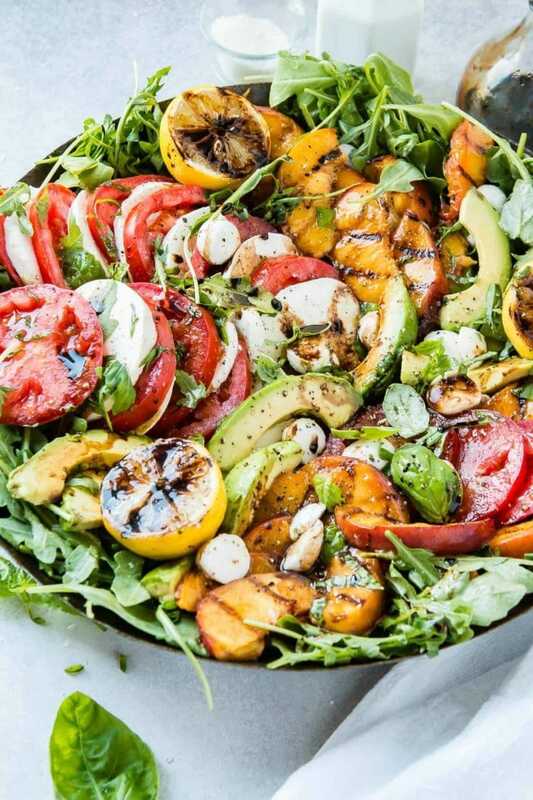 You can skip the greens on a caprese salad but when we are feeding more people, like we did at a church BBQ with this salad we like to add arugula or an arugula mix to the bottom which helps feed more people, and we like that peppery crunch next to the softer ingredients. Can You Make a Caprese Salad Without Basil? I think Basil is an important ingredient in Caprese Salad. Overall, this is perfectly wonderful without the basil, but would be heaven with the basil, I mean a caprese is a caprese. Start your balsamic reduction first as its going to take the longest. Grill your peaches and lemons and let them cool while the balsamic is reducing and then cooling as well. We let it all sit in the fridge. To prepare this dish ahead of time, you can do the balsamic and store it in the fridge, slice the tomatoes and mozz. and store them on separate plates in the fridge along with the peaches. Even the greens are already in their serving dish in the fridge to keep them crisp. Once you’re ready to go just fire up the grill and cook the fruit. The avocados are sliced last as those tend to brown. Quick side note. No more grabbing avocados at the store with your whole hand and squeezing them. It bruises the fruit for the next customer and isn’t the best way to tell if it’s ripe. 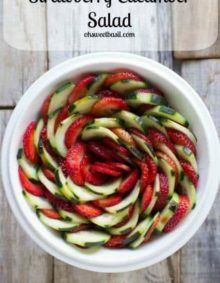 Instead, grab the avocado with your finger at the top by the stem and your thumb on the bottom of the fruit, gently pressing the top with your finger. It should feel firm but soft when it’s ready to go. That’s it! 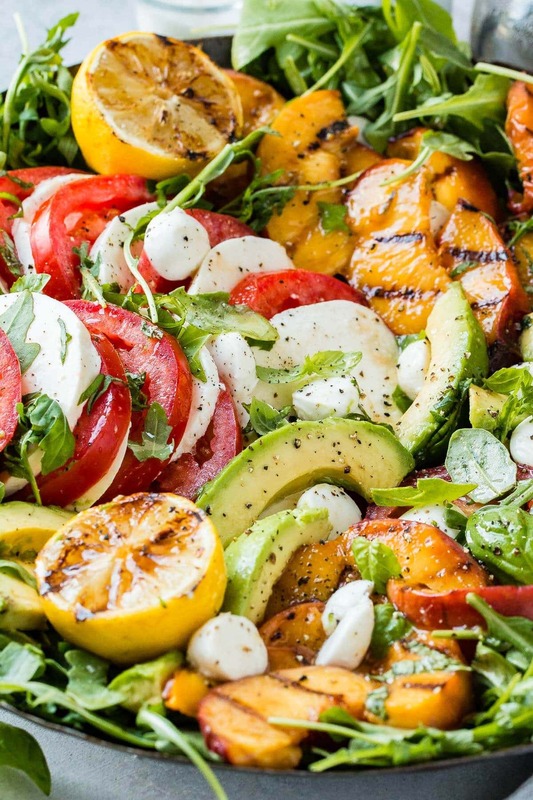 Enjoy your grilled peach avocado salad with friends, family and neighbors! Well this is it. The most amazing caprese salad I've had and it's a grilled peach avocado caprese salad with a balsamic reduction and grilled lemons. It's so easy though! Place the balsamic vinegar in a skillet or small saucepan and sprinkle in the sugar. Cook on medium heat until it comes to a boil, then quickly turn down to a simmer, and cook until reduced by half, about 10-20 minutes, but watch in case your stove cooks faster. The vinegar should coat the back of a spoon once it's ready. Set aside in the fridge to cool. Brush the flesh of the lemons and peaches with olive oil. Heat a grill to medium high heat and place the fruit right on the grates. Cook for 1-3 minutes or until marks appear, remove the lemons, then carefully flip the peaches using tongs. Set aside on a plate to cool. We place ours in the fridge. 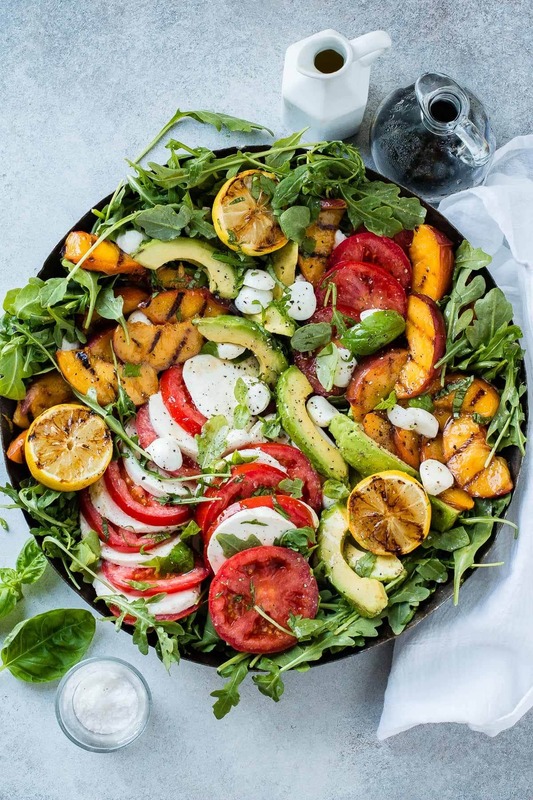 Fill a large salad platter, not bowl, with the greens and assemble by arranging the fruits over the top with the mozzarella, a drizzle of olive oil, balsamic reduction and salt and pepper. Never slice and place your avocado until right before serving. Look in our post for our preferred brands of salt for this dish. Salt makes a world of a difference when it's good salt and it's not expensive! I am assuming you mean mozzarella pearls not pears. Right? hey girl- this salad looks so good!